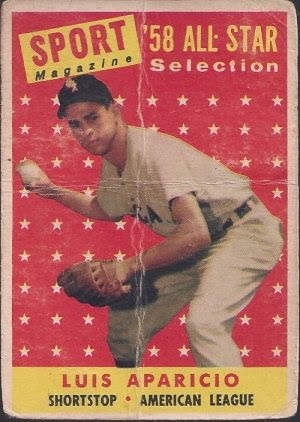 Players get nickhames, but I don't think a lot of double play combos get a good nickname. There might be a few out there, that a Google search isn't turning up, but usually, the second baseman and the shortstop just get known by their last names. Morgan and Concepcion. 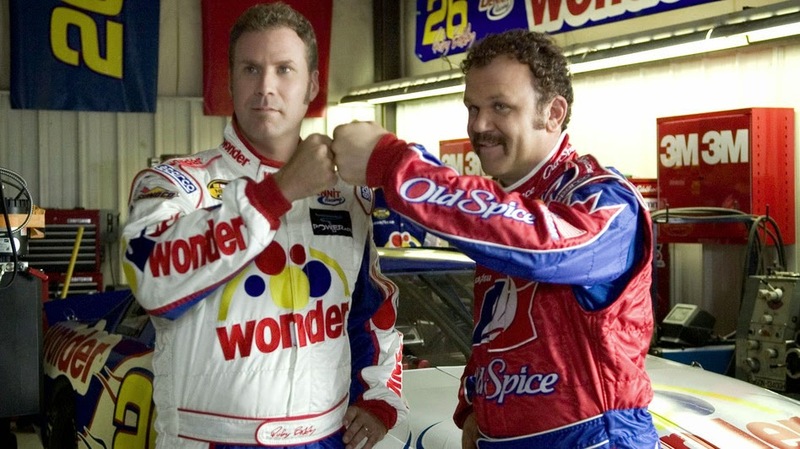 Russell and Lopes. Trammell and Whitaker. No flashy nicknames like you find in hockey, football or auto racing. So while thunder and lightning certainly doesn't refer to Little Louie and the Mighty Mite, it would be a shame to show off the cards Wes sent for my two projects in separate posts. 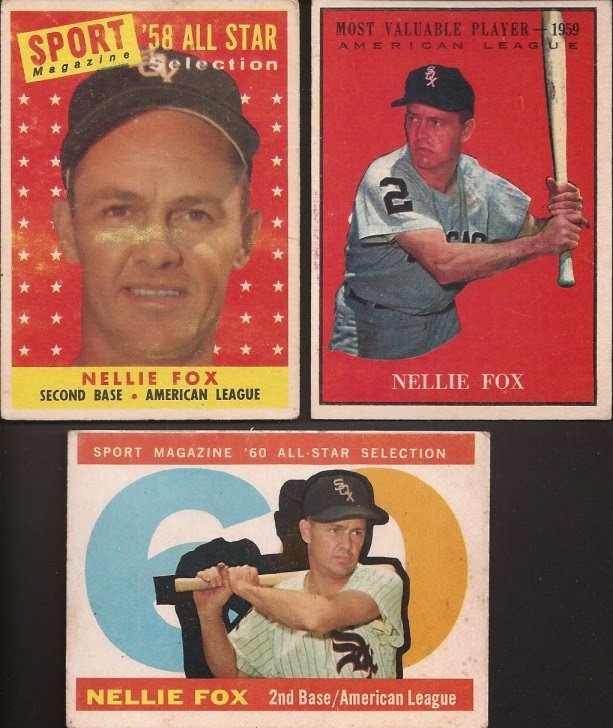 Wes sent a total of 8 cards to add into my Nellie Fox Project. That 60 All Star card was a hard find for my Pierce Project, so it's nice to cross that off. Lot of red in the other two cards. Slightly chewed up by scissors, but I love these cards. 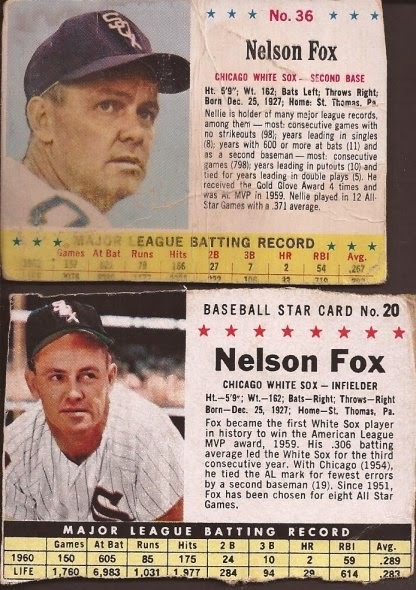 Top is a 1963 Jell-O card, while the bottom is from a 1961 box of Post. I like the smaller size of the Jell-O card because of the natural size of the gelatin box. Hey Night Owl - they cut off the top of his head ala Panini. Still, this is a gorgeous card. 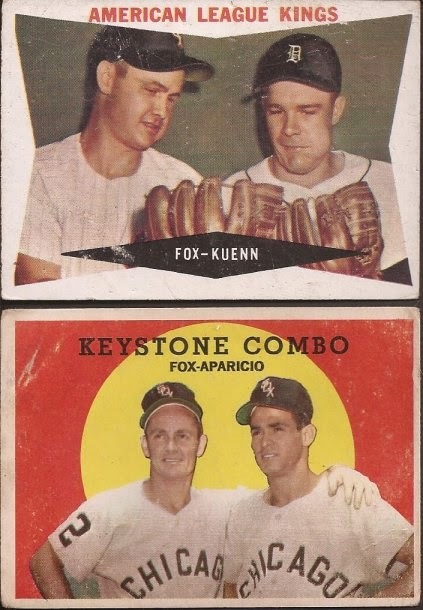 The Keystone Combo card doesn't go against either Project - not until I get a 2nd for the binder. 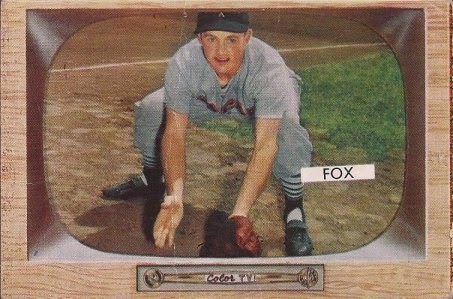 But see how nice and simple these cards are, Topps? And the complete lack of manufacturer's marks? Vintage always rules over modern. Last is just one card into the Aparicio section of the binder pages. I imagine the kid folded this up and stuffed it into his back pocket heading off to the park for a pickup game. Or to school. Now, it's in my hands and no more folding. On to the really good stuff next. Serials, relics, autos and the best of the best.